SWF to GIF is conversion software for convert SWF to GIF. SWF to GIF Converter change the file format of flash from SWF into animated GIF or seriate images. SWF to GIF Converter will be more suitable for transmission, using chat tools to release dynamic picture and any situations which can not use flash document. SWF to GIF Converter can optimize the output, ensuring the same quality, the smallest document. ...... process, SWF to GIF can retain the effect of SWF file intact and provide the multi-level choice of the quality to adapt to different purpose. 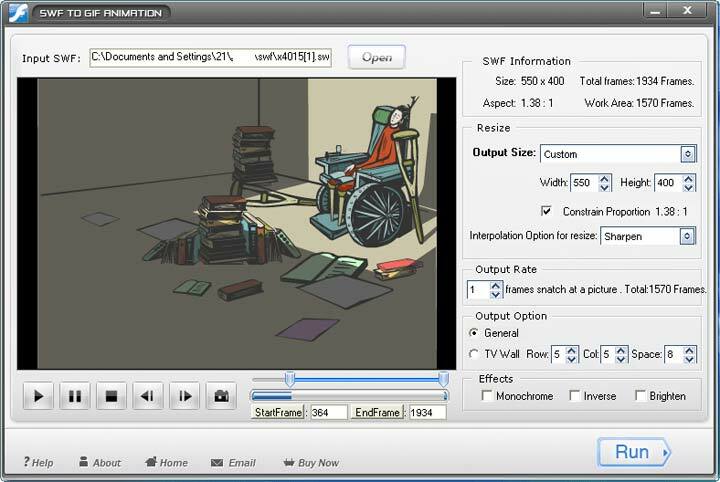 SWF to GIF converter include changing file size, and set the output effects in advance . SWF to GIF uses the most advanced decoding technology, not only can identify the common flash SWF files, but also support perfectly for Script SWF which the majority of similar software can not identify. Because GIF files are small, and support the flash show, it's very popular, but many friends have a certain degree of difficulty when producing GIF flash, SWF to GIF solve this problem for you. You just need input SWF files into SWF to GIF software, and then operate in accordance with these steps, you can get your own GIF flash images. At the same time, you can also use our company's watermark software, producing your own GIF flash logo. SWF to GIF also supports exporting single picture in any format from the SWF file. Convert Flash (SWF) and Video (AVI) files to animated GIF. The converter AnyToGif allows you to convert to gif-format any image. Create standalone multimedia photo albums, screensavers, e-cards, web galleries. 2GIF - command line batch graphic converter to GIF image file format. Convert SWF flash movies into re-distributable Windows screensavers. Video to GIF Converter can convert video to gif animation and static pictures. Qweas is providing links to SWF to GIF 3.2 as a courtesy, and makes no representations regarding SWF to GIF or any other applications or any information related thereto. Any questions, complaints or claims regarding this application SWF to GIF 3.2 must be directed to the appropriate software vendor. You may click the publisher link of SWF to GIF on the top of this page to get more details about the vendor.